The highest praise I can offer Ant-Man is that it feels tonally different to anything else Marvel have ever offered us. Normally this would be a given; most studios are content on offering films of a wide range of styles and tones. But Marvel have fallen into a bit of a flunk lately, seeming more content to give us more of the same than try anything different. 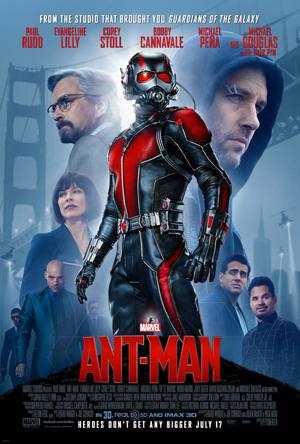 Ant-Man is one of those projects that just shouldn't work; a man in a suit who can shrink to the size of an insect and telepathically control ants to do his bidding. It's preposterous, it's silly, it's totally ridiculous and it should be a complete mess. As it turns out, it is a bit of a mess, yet the preposterous, silly and ridiculous moments are the only parts of this film that feel like a triumph. Ant-Man is very obviously burdened by its writing history. This version of the film has been in the works since 2003, when Edgar Wright (the mastermind behinds the excellent likes of Hot Fuzz and Scott Pilgrim Vs. The World) wrote a treatment for this character and was immediately labelled the project's director. But after countless redrafts and on-off production, Wright left the director's chair in early 2014, with Peyton Reed taking over yet still directing Wright's story and script. It's a complete muddle of a production process, and it's reflected in the film frequently. Wright has a knack for wild, off the walls action scenes, and his visions stand loud and clear in the finished product, particularly a small action sequence that takes place inside a briefcase to the tune of Disintegration by The Cure. Yet when these moments are contrasted against any time Ant-Man tries to take itself seriously, the whole thing just becomes muddled. The biggest issue the film has is trying to keep us interested when it isn't trying to be funny or silly, because when the humour comes first this film is a total blast. Ant-Man has a terrific sense of humour, I would happily label it the funniest Marvel effort yet. Hell, I could probably label it the funniest film in a year. This is, again, benefited by the fact that the humour is completely different to anything Marvel have tried before. We still have some great one-liners from odd characters (Scott's daughter's line about "Mummy being so happy you're here she choked on her drink" is a particular standout), but we also have the concept of small objects becoming huge and crossed audio tracks as one voice plays out of various characters' mouths. It's an unusual style for a superhero film to adopt, but it's a breath of fresh air that we rarely have the pleasure of enjoying in Marvel productions. Which is the main reason Ant-Man is such a frustrating film. It's almost the polar opposite of everything Marvel have already tried, taking much that didn't work and making it enjoyable. But, unfortunately, it also seems to have taken a few things Marvel have always excelled at and allowed them to fall apart. Whilst Marvel tend to always have a solid hold on their character work, and can always add extra layers to characters we seem to think we already know, Ant-Man struggles to make anyone interesting besides Scott Lang himself. The turbulent father/daughter relationship between Hank Pym and Hope is a particularly annoying element of the film. It never really amounts to much while it's there, and once it builds to the inevitable and immediately foreseeable makeup moment it feels like a waste of time because not enough has worked beforehand to make us want them to reconcile. And even when they do their dynamic doesn't change, which renders the whole subplot pointless. This weak characterization is worsened by the fact that the story itself doesn't offer much hope either, and neither does the way it's told. Returning to an origin story was always going to be interesting to see; we haven't had a simple superhero origin story from Marvel since we first met Captain America back in 2011. But it just hasn't worked this time around, the origin story tropes aren't weaved in as successfully and it feels far too conventional and formulaic. Marvel's biggest issue for a long, long time has been trying to break away from the formula. They succeeded in setting a new tone here, but the story still plays out the same. When Scott is sent into the quantum realm at the climax of the film's admittedly excellent final act (which we're coming to soon) we're treated to a visually stunning sequence, but there's no emotional weight to it. We know how these films work now, we know he'll get out. Whilst it's nice to look at, it just doesn't have any grip. But leave it to Marvel to take it up a gear when they need to. If this film's first 75 minutes fail repeatedly in terms of plot and character work, the final forty five are a blast of superbly choreographed action, seamless humour and simple yet wonderfully effective thrills. It all comes together to form the best final act I've seen in a Marvel film in years, it is that good. When Ant-Man doesn't care about seriousness and is content to be preposterous, silly and ridiculous it becomes something truly special. But it doesn't hit this note often enough, and it never feels like it's in control of itself when it tries to be grounded. Which is a real shame, as grounded human drama is something Marvel have excelled at frequently. Ant-Man is never dull, the consistent humour and Paul Rudd's likeable performance keep things enjoyable, you just can't help but wish for something more consistent in a factor other than likability. This is one of the most giddily watchable films of the year, but despite its best efforts, it just can't quite manage to be anything more than that. To Summarise: It suffers greatly from a tiresome plot and weak characterization, but Ant-Man is a consistently funny, entertaining adventure that benefits from a tone unlike anything Marvel have offered before.